A friend of mine recently posted on Facebook that you could take the second space after a period away from him when you pry it from his cold, dead fingers. I responded with this image of Ben Wyatt from Parks and Recreation. But I said I’d refrain from sharing my thoughts unless he really wanted to hear them. He said he did, so here goes. Even though the extra space has its defenders, using two spaces between sentences is wrong by today’s standards, but nearly everybody is wrong about why. The usual argument goes that it’s a holdover from the days of typewriters. Typewriters use monospaced fonts (meaning that each character takes up the same amount of horizontal space, whether it’s an i or a W), which look spacey compared to proportional fonts (where characters have different widths according to the size and shape of the actual character). Since monospaced text looks spacey already, it was decided that an extra space was needed between sentences to make things readable. But since we’re now all writing on computers with proportional fonts, we should all ditch the two-space habit. Case closed! You may have been taught in typing class to type two spaces at the end of a sentence, but the practice has nothing to do with typewriters. It’s actually just an attempt to replicate the look of typeset text of the era. There are other blog posts out there that give a much more thorough account of the history of sentence spacing than I’ll give here (and I’ll link to them at the end), but I’ll use some of the same sources. But before we dive in, some definitions. Spacing in typography is usually based on the em, a relative unit of measurement that’s as wide as a line of type is tall. That is, if type is set at 12 points, then an em is also 12 points. The name derives from the fact that a capital M in many typefaces is about as wide as it is tall. The em dash (—) is so named because it’s 1 em wide. A space the width of an em is called an em space, an em quad, or just an em or a quad. An en space or en quad is about the width of a capital N, which is half the width of an em space. An en dash, as you guessed it, is 1 en wide. A three-em space is not three ems wide but one-third of an em (that is, it’s a three-to-an-em space). Also called a thick space, this is the standard space used between words. There are also smaller spaces like four-em and five-em spaces (known as thin spaces) and hair spaces, but we don’t need to worry about them. Space evenly. 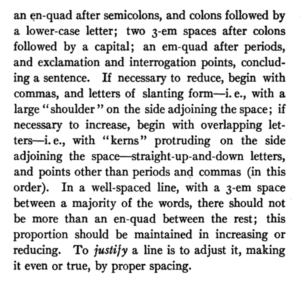 A standard line should have a 3-em space between all words not separated by other punctuation points than commas, and after commas; an en-quad after semicolons, and colons followed by a lower-case letter; two 3-em spaces after colons followed by a capital; an em-quad after periods, and exclamation and interrogation points, concluding a sentence. Remember that typewriters were generally monospaced, meaning that the carriage advanced the same amount for every character, including spaces. On a typewriter, there’s no such thing as a thin space, en space, or em space. 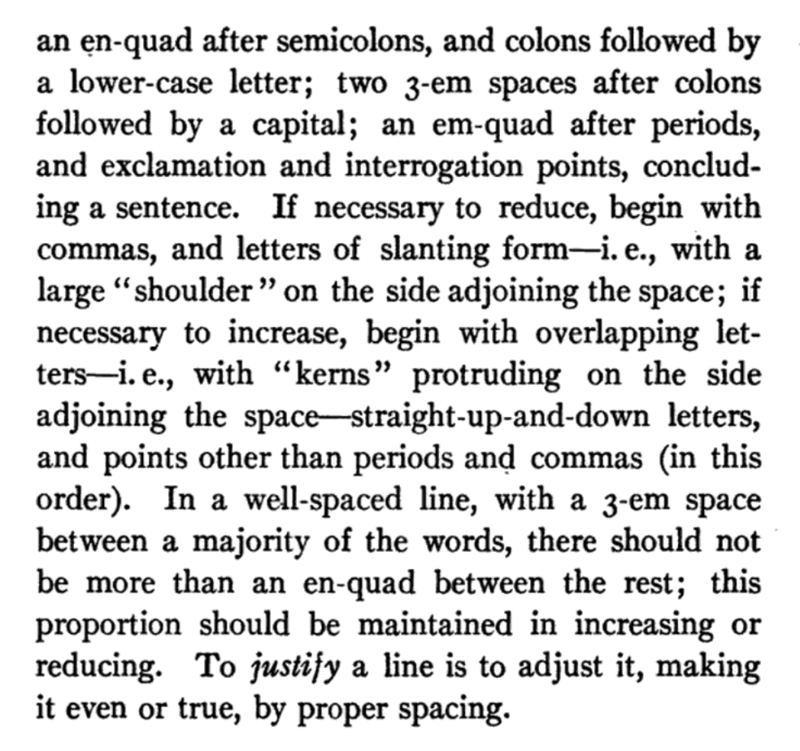 Consequently, the rules for spacing were simplified a bit: a thick space between words and following semicolons or colons followed by a lowercase letter, and two thick spaces between sentences or after a colon followed by a capital letter. At this point the two-spacers may be cheering. History is on your side! The extra space is good! But, again, not so fast. Around the middle of the last century, typesetting practice began to change. That complicated system of spacing takes extra time to implement, and financial and technological pressures eventually pushed typesetters to adopt the current practice of using a single thick space everywhere. Chicago began using a single space between sentences in 1949, when the 11th edition of the manual was published. But this wasn’t necessarily an innovation. English and Americans typesetters may have used extra space, but French typesetters did not—they used just one space between sentences. Clearly not everyone thought that the extra space was necessary. Unfortunately, there’s no evidence to back up the claim that the extra space aids readability by providing a little more visual separation between sentences; what few studies have been done have been inconclusive. Inserting extra spacing means extra time for the editor, typesetter, and proofreader, and it’s extra time that doesn’t appear to add any value. (Conversely, there’s also no evidence that the extra space hurts.) I suspect that the readability argument is just a post hoc rationalization for a habit that some find hard to break. After all, most people alive today grew up in the era of single spacing in professionally set text, so it’s what most people are familiar with. You never see the extra space unless you’re looking at an older text, a typewritten text, or a text that hasn’t been professionally edited and typeset. But most people who use the extra space do so not because of allegedly improved readability but because it’s simply what they were taught or because they say it’s impossible to break the habit of hitting the spacebar twice after a sentence. And I’m skeptical when people claim that double-spacing is hardwired into their brains. Maybe I just have an easier time breaking bad habits than some people, but when I was taught to type in eighth grade (on typewriters, even—my school didn’t have enough money to stock the typing lab with computers), I was taught the two-space rule. And almost as soon as I was out of that class, I stopped. It took maybe two weeks to break the habit. But I already knew that it was an outdated practice, so I was motivated to abandon it as soon as my grade no longer depended on it. If you’ve been typing this way for decades, though, or if you were never informed that the practice was outdated, you may be less motivated to try to change. Even if you write for publication, you can rely on your editor or typesetter to remove those extra spaces for you with a quick find-and-replace. You may not even be aware that they’re doing it. Of course, even some people who should know better seem to be unaware that using two spaces is no longer the standard. When my oldest son was taught to type in school a couple of years ago, his teacher—who is probably younger than me—taught the class to use two spaces after a sentence. Even though typesetters switched to using a single space over fifty years ago, and typewriters have gone the way of the rotary phone, the two-space practice just won’t die. So the real question is, what should you do? If you’re still using two spaces, either out of habit or because you like how it looks, should you make the switch? Or, put another way, is it really wrong to keep using two spaces after half a century after the publishing world has moved on? Part of me really wants to say that yes, it really is that wrong, and you need to get over yourself and just break the stupid habit already. But the truth is that unless you’re writing for publication, it doesn’t actually matter all that much. If your work is going to be edited and typeset, then you should know that the extra space is going to be taken out anyway, so you might as well save a step by not putting it in in the first place. But if you’re just writing a text or posting on Facebook or something like that, it’s not that big a deal. At worst, you’re showing your age and maybe showing your inability or unwillingness to break a habit that annoys some people. But the fact that it annoys some people is on us, not you. After all, it’s not like you’re committing a serious crime, like not using a serial comma. This post on Creative Pro is fairly exhaustive and rather sensible, but it still concludes that using two spaces is the right thing to do when using monospaced fonts. If the rationale behind using two spaces on a typewriter was to look like typeset text of the era, then there’s no reason to continue doing it.